forgot the screw in the motor mount stick and third flight it worked it's way loose. No damage. rubber band held it on for the next couple flights that day. for goggles i have a cheap (relative to other ones) pair. $90 on amazon. diversity, dvr, screen comes out, av in, playback of footage, 2.5 hours battery life, auto search for channels. i think they are called the ev800's. branded as makerfire. i can link if you want. my only complaint is that the dvr only records for 3:00 before starting a new clip. that's fine for me bc i only have a whoop that flies for roughly 3.5mins before dying so landing at 3:00 is fine with me. battery at like 3.7v when i land so..
2014: After watching all the ft videos i finally decided to build a plane. I had maybe one flight in my life before this and had basically learned everything online. I wasn't aware at the time that there was a local club nearby that could have helped me out. I took my versa wing out for its maiden flight. Now this was something i had built up to over several months. I had quickly fallen in love with flying wings for some reason (still am). I bring this point out as it didn't fly that day. At all. It was one of the worst days i have had, to have all that build up excitement and than just repeatedly fail. I had too little of a motor, i didn't know how to launch a wing, and knew nothing of the importance of cg. Now this could have been the time when i just stopped rc totally and walked away. But after a coupe days i built a storch, had a great time, researched the problems i had with the versa wing and got it flying. It was also quickly after that that i got my first fpv flight thru my gopro on the versa. I think this learning experience was pretty important. My buddy says i never listen to him when he gives me tips on building/rc but i think its because i want to learn about this myself and see how things work, which i tie back to these beginning experiences. Number one with wings is make sure the CG is right where it needs to be. Secondly check the neutral position of the elevons, the reflex. Too much reflex is the number one reason i have crashed on maidening wings. Too much reflex means that as soon as your plane leaves your hand its trying to climb and is instantly in a stall. Its very hard to troubleshoot cause you think you didnt throw right, or not enough power. As far as launching a wing, having someone else will make it much less stressful on maiden. as far as launch style, this is something you are going to have to figure out. Some people love the football launch, other swear by the side toss. The one i have had most success with is to grab it by the nose or just off the side and launch overhead. If you have a buddy have them two had it on each side of the nose and toss behind them. my problem is all the people i know are not awfully good at throwing gliders. so i don't know how good they would be at wings. i will probably end up throwing it myself. thanks for the tip on reflex. i am going to start with it a tad nose heavy for safety. I launch with my left hand, throttle at 2/3ds, throttle lock on the top right switch, hold it out, hit the throttle lock, let go. i see. thats a pretty slow wing. looks nice. LOL - an error leading to, well, not really a crash with my FT Explorer. CHECK YOUR MOTOR MOUNTS! I was running a BIG prop on my explorer a couple weeks ago. BIG - like 10 inch, just barely clearing the main fuselage beam on the back. Needless to say, they don't fly well like that. 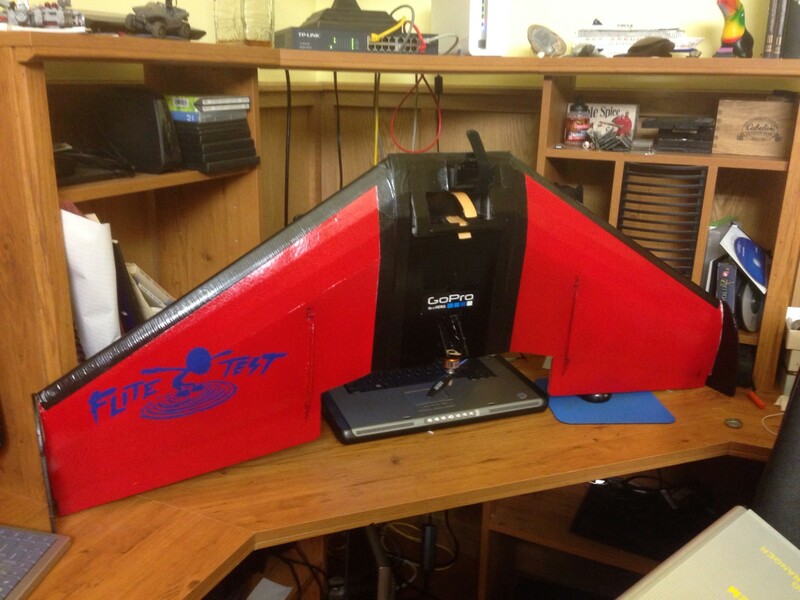 But...a couple scrap pieces of foam, smaller prop, some packing tape and glue, and right back in the air! ok thanks for the videos. have you built the versa wing? if so, i was wondering, i only have a 1000mah battery. in the build video they use a 2200 or 3000. will my battery be too light for a pusher config? The first launches on the third video are very similar to my style. Very little effort imparted to the aircraft. Mainly just stabilized. oh yeah way more battery. if no camera i would guess 2200 3s minimum, but it has been a while. This also depends heavily on how heavy you build your plane and weight of the motor if a pusher. 1) This plane needs a decent amount of air going over the wing, or else it stalls. With the particular motor and battery I've got for flying it, it translates to, "half throttle is the absolute MINIMUM, unless you're landing, and even then, you don't want to cut the throttle completely." 2) It's GOT to be balanced properly. If it's not, it's going to porpoise and make it difficult as Hades itself to recover that sucker, and it's probably going to nose in to the ground, imitating a lawn dart. 3) Make sure your plane is different colors on the top and the bottom!!! If the plane is 100' up, and it's all one solid color, how can you tell what's top and what's bottom? Found that out when I tried to maiden my MiG, because I'd primered it before putting camo on top and white on the bottom - and even though it's a cool color scheme like the old warbirds, there's a reason it was done; grey/white blended in well with a cloudy day, so people on the ground had a harder time spotting the plane. Put some sort of markers on the bottom so you can tell what's top and what's bottom easily, if you should tilt it at an angle to you. 4) Make sure your wheels ROLL, if you have wheels on landing gear. I can't stress this one enough; I was landing my dad's Simple Cub on its maiden flight, and right as I touched down, the right wheel stopped rolling, causing the plane to want to spin around. The good news with that is that I was able to give it full rudder in the opposite direction, and keep it corrected and on the runway until it came to a complete stop (which was only about 5 feet of distance, fortunately; I was flying into a headwind, and essentially stalled the plane and had it kind of drop the last couple of inches to the ground, which may have caused the wheel to stop rolling; I'm not 100% sure, as it may have been some of the hot glue my dad used to attach the wheels as well). If the plane had been going any faster on the landing, I probably would have spun the plane and tipped the wing into the runway, flipped the plane over if there had been a strong headwind, all sorts of things. ok. i could put on my action camera but i do not want to risk that since this is my first wing. i have some pieces of metal rod i could tape into the nose. that could work as good nose weight. one of those chunks of metal weighs about as much as like 3 or 4 1000mah 3s lipos. lol. one right in the nose with my battery about over the cg should be sufficient. I saw some on gearbest the other day for $50 that had Dvr and diversity, if they are still that price I might just pick some up sometime. Also I have seen those before and right now that would be my ideal setup. i have looked at cheaper ones and often times they are just much worse quality. i was looking at some just 10 dollars cheaper on amazon. a knockoff of the ev800's. lots of great reviews. also a few too many "it broke too soon" ones. or "battery doa" for 10$ more i though the real thing would be better. $90 still isnt bad. that was my big Christmas gift. this year er last year technically.